Once the preserve of dodgy chippies, fish cakes are now smart dinner party fodder. Put the onion in a large frying pan, sit the fish on top and pour the wine or stock over. Bring to a gentle simmer, cover and cook the fish for 6-8 minutes or until cooked through. Strain out the onion and mix into the mashed potato with the herbs. Flake in the fish in decent-sized chunks and season. Gently mix everything and, using floured hands, shape into 8 cakes. Lightly dust with flour, dip in egg and then in breadcrumbs. Chill for at least 30 minutes (important or they will come apart in the pan). Heat 1cm oil in a large frying pan. 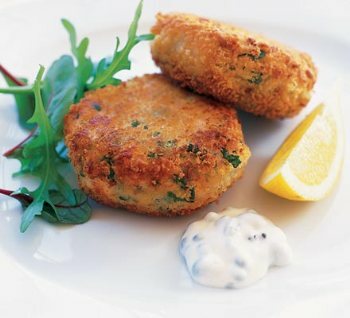 Fry the fish cakes in batches for 3-4 minutes each side or until they are golden, crisp and heated through.